Cairo giants Zamalek will be looking to overcome last week's defeat by Ittihad of Alexandria in the Zayed Cup when they face Masry in an Egyptian league game at Alexandria's Borg El-Arab stadium on Thursday. Zamalek, who are leading the league table, slumped to a stunning 1-0 defeat at home to Ittihad of Alexandria last week, to exit the Zayed Cup round of 16. 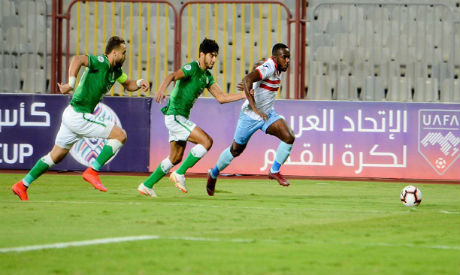 The Arab defeat has marred Zamalek's winning run in the Egyptian league, which had seen the White Knights claim six successive victories to top the league with 32 points, six points ahead of the second-placed Pyramids. "There is no unbeaten team in the world of football,” Zamalek football supervisor Amir Mansour told reporters on Tuesday. “The Arab elimination is not acceptable, but we have to put it behind us and to focus on the future, especially in the league." A win against Masry on Thursday is important for the club, who are looking for their first league title since 2014. Coach Christian Gross will deploy almost the same squad that lost against Ittihad. "We have the best squad in Egypt and losing a game is not the end of the world," Zamalek assistant coach Amir Azmi told reporters on Wednesday. On the other hand, Masry will be also looking to bounce back from their Egypt Cup defeat. The coastal club were stunned by second division side Guezira Matrouh with a 2-1 loss in the Egypt Cup, to exit the competition in the round of 16. Interim coach Moustafa Younes expressed his displeasure over the recent defeat, stressing that his only consolation will be defeating Zamalek in Thursday's clash. Masry are 10th in the League table with 16 points, with three matches to go.